I am very excited to be partnering up with Noble House Designs! I am such a fan of these hand-made one of kind statement pieces, down to the coloring and pairing of each bauble. The craftsmanship and attention to detailing behind each item is amazing. The 'white' necklace I am wearing is a neon pink and orange (love the brightness). Inspiration pulled from her travels around the globe, this necklace specifically is a mix from both Asia and Africa. The collection is full of color, uniquely shaped baubles and tribal influenced pieces. To kick off Noble House Designs + The Daileigh we are extending to you a special promo on this 'white' necklace. Such a great neon outfit!! This is a very pretty look! 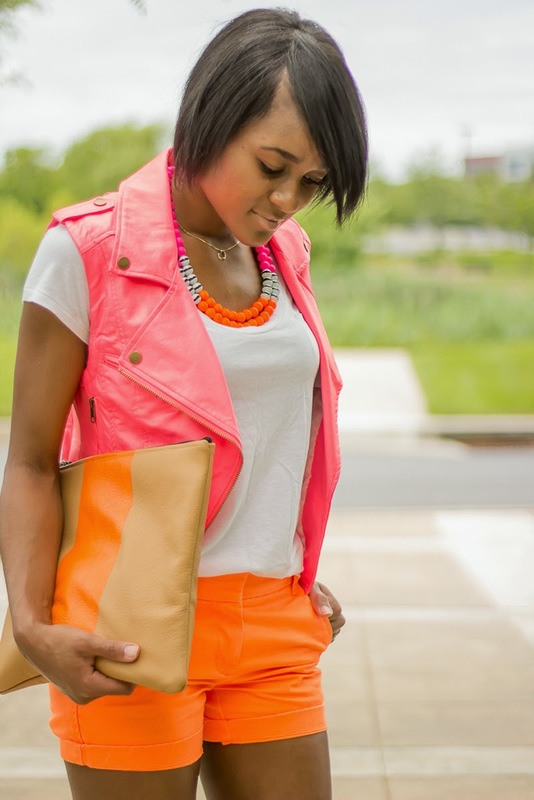 The colors are perfect for summer, and pink and orange are great for color blocking. wow,this color is so focus my eyes. i like the neon very much. Cute NEON look. That necklace is to die for! Gorgeous. Let me check this site out! I love how bright this outfit is! The orange and pink does go very well together!